April 10, 2019 — One recent, sunny morning in the Bukit Batikap Protection Forest, our Post-Release Monitoring (PRM) team from Totat Jalu Camp headed out for the day to track and observe released orangutans. 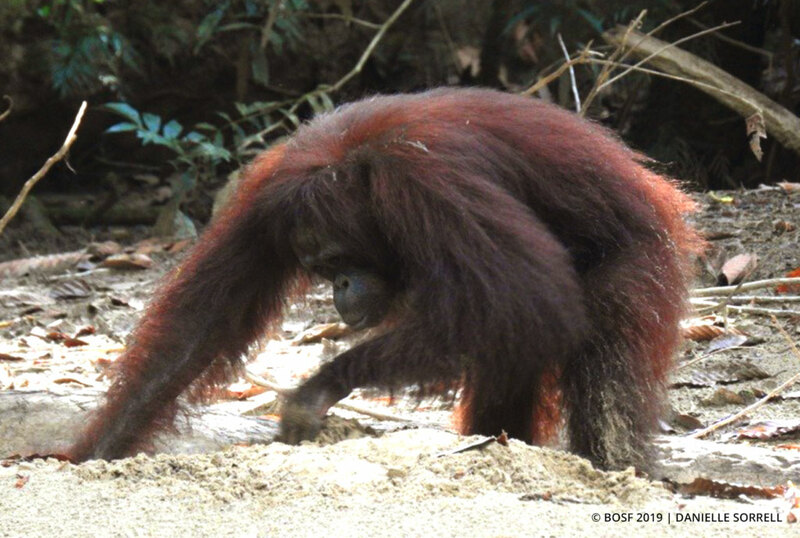 The team took a boat upstream, and along the way spotted an orangutan sitting on a sandy bank; it didn’t take long for team members to realize that it was Zakia! Zakia, a 15-year-old female orangutan, was released to Bukit Batikap in April 2016. With her brooding expression and intense eyes, Zakia kept her gaze fixed on the team and the boat passing by her as she sat on the river bank. A fearless, dominant female, Zakia is typically not shy about asserting herself, and always pays particularly close attention to any human who tries to come her way. 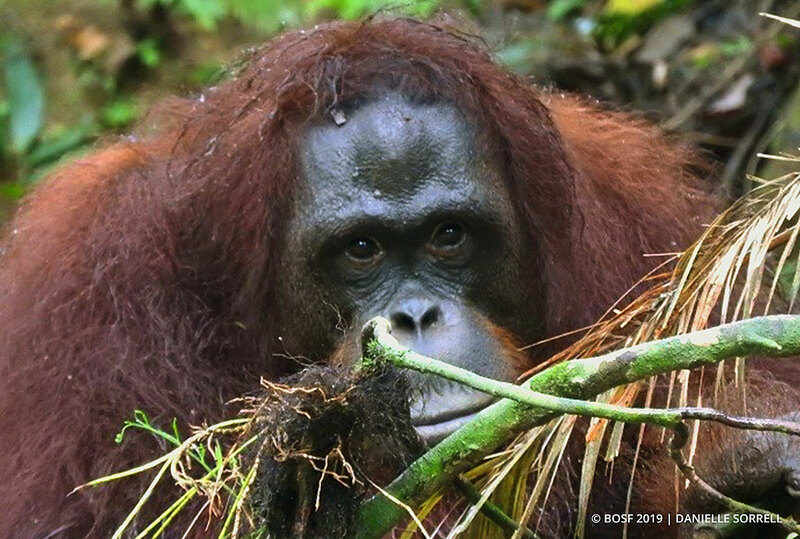 Unable to locate other orangutans in the forest that morning, our PRM team took the opportunity to observe Zakia from the other side of the river: And Zakia, did not disappoint. While normally an uptight and intimidating presence, Zakia appeared to be carefree on this occasion and was enjoying her surroundings. She rolled around on the sand and also played with it. She executed a few somersaults, then sat for a moment, staring at the sky. She looked as though she was in a total state of peace. After some time, she swung off through the vines and whipped around in the air as she moved from vine to branch. Zakia seemed to be having the time of her life! This was a thoroughly enjoyable experience for our PRM team members, especially since it is uncommon to witness Zakia in such a joyful mood. Our team pondered over what had caused Zakia to be so playful that morning. 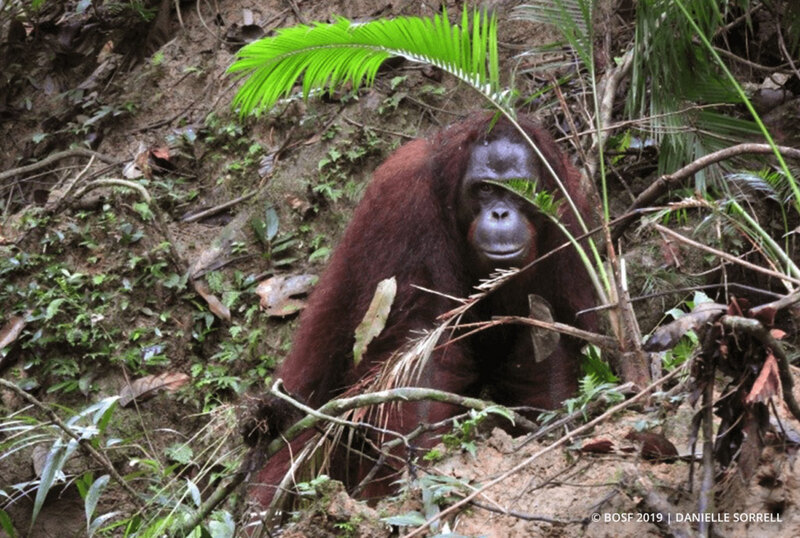 Perhaps her relaxed demeanor could be attributed to Cilik – a juvenile male orangutan who had been seen spending time with Zakia – finally leaving her side. In solitude, she seemed to be enjoying her freedom and peace. Keep being a fierce, independent female, Zakia!